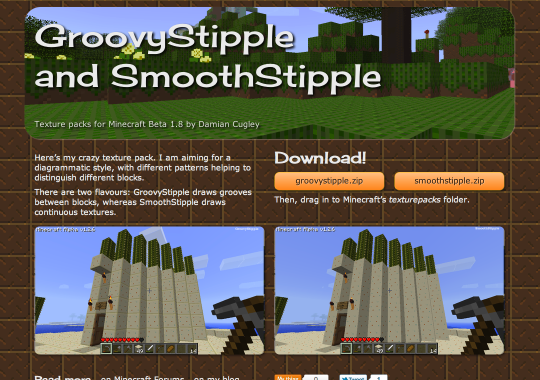 OK so I finally decided to resolve my confusion as to where on my site to put my Minecraft texture packs by creating a dedicated GroovyStipple and SmoothStipple mini site. Bascially it is a brochure with two download links. Here’s what went in to it. There are no interactive features so the HTML, CSS, and graphics are all just files. I edited the HTML and CSS with jEdit, my current default text editor—with this simple a site there was no point using anything fancier. The graphics are mostly screenshots from the game. With a dark background you can either go for light text on dark or place your text in light-coloured boxes floating over the ground. I used the latter for Texturejam, so I thought I would use light-on-dark this time around. It needs bigger, bolder type to be readable on a textured backdrop, which is OK because I am keeping the amount of text on the page to a minimum. The font for the title is Cherry Cream Soda by Font Diner. I am using the version hosted by Google so that keeping up with browser support is their problem, not mine. The items on the page are mostly boxes of a given size and the layout is mostly achieved through CSS floats—the body element acting as a correct-sized bucket in to which the units are poured. The size of the body varies according to the available width, using the magic of CSS media queries (here is a randomly selected tutorial). The sizes used are 720, 960, 1200, and 1440px (or 9, 12, 15, or 18 units). The smallest size should suit a 768 × 1024 screen like an iPad, the 18-unit design looks OK on my 1680 × 1050 monitor. Some of the items on the page change their width and positioning as well to try to make an acceptable layout. The point of the grid is to have a layout where there are enough things aligned with other things to make it look tidy instead of just a mess. The biggest risk–especially for the likes of me—is that you end up with a kind of TV dinner effect of boxes arranged in a boxy pattern. The problem with this page is the two screenshots directly underneath the banner picture. I may have to come up with a different solution to that part of the page. One more thing: some of the older screenshots vary slightly in height, which caused the float-wrapping approach to create unslightly gaps. I fixed this with jQuery Masonry. Getting a domain is pretty easy once you know how. As a .me.uk domain. stipple.me.uk cost £6 for two years from Gandi (a registrar I chose based on a mention on some discussion and their being based in the EU). Gandi also supply the DNS server that lets web browsers translate stipple.me.uk in to the IP address of my server at Linode in London. —plus another clause to redirect www.stipple.me.uk to stipple.me.uk. Even though there is no interaction I am following my convention of giving each site its own user account and home directory. After months at work spent using rake, fab, and knife incantations, it is nice that I can do a deploy by typing a simple make deploy. Social-media buttons have become something of a plague on web sites these days. I don’t want a mess of buttons, but I did want to add a bare minimum: Twitter and Flattr. Twitter because it really is more convenient to have the address shortened for you, and Flattr because I really would like its model of micropayments for content to be better known. The Flattr concept is like the FaceBook ‘like’ button, except that when you click it you hand over a small quantity of money rather than a tiny sliver of your soul. The difference between Flattr and other micropayment systems is that you decide ahead of time how much money you are willing to put in to supporting the arts online, and the amount paid per click is calculated accordingly. I don’t expect to make serious money from the Flattr button on a site this obscure. And so it is my silly texture packs GroovyStipple and SmoothStipple have their own special place on the Web.